Cellulose: a molecule comprised of carbon, hydrogen, and oxygen that is found in the cellular structure of virtually all plant matter. Cellulose provides structure and strength to the cell walls of plants…. its what makes plants fibrous. Fungi: Fungi is its own kingdom of life, neither plant nor animal, which contains many different fungi including molds, yeasts and different types of mushrooms. When I say ‘fungi’, I mean mycelium, the web of threadlike cells which acts like the roots, stems and leaves of plants- the part that breathes, eats and the mushrooms that pop out of the ground sometimes. Flush: a crop of mushrooms collectively forming within a certain time period, often repeating in a rhythmic way. Lignin: the organic substance that, along with cellulose, forms the structural basis of most woody materials. What makes wood rigid and hard. Mushroom: the reproductive structure, or ‘fruit’ of certain fungi, like the apple on a tree. The fungus’ fruiting bodies. Mycelium: a fungal network of threadlike cells; the fungal organism; the part that takes in food and acts like the roots, stems and leaves of plants. Myceliated: when the mycelium has taken over/grown all the way through a substrate. 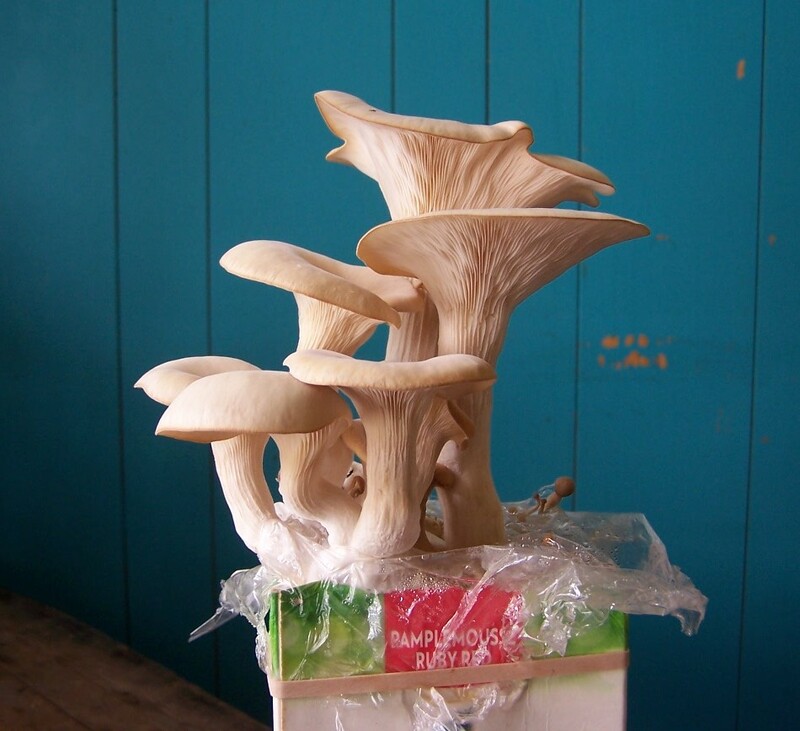 Mycorhizal: Myco means mushroom, rhizal means related to roots, so mycorhizal fungi are those that form symbiotic relationships with plants where both the fungi and plant benefit. In fact most plants have mycorhizal partners, from Douglas fir trees to grasses. Mycorhizal fungi mycelium connect with plant roots and extend way beyond (10-100x), because of that they are able to bring nutrients and water from well beyond what the roots could reach on their own. Plants with mycorhizal fungi partners grow way better, and can resist disease better than those without. Fungi benefit because they eat some sugars from the plant. Pasteurization: process of reducing the amount of competitor fungi and bacteria (or at least putting them at a disadvantage) in a substrate so that the mushroom you want to grow can flourish. This gives the mycelium an advantage over harmful organisms, allowing it to take over the substrate and eventually produce mushrooms. Usually involving heating the substrate with steam or hot water for a period of time, alternatively using cold water pasteurization and/or chemical treatment (hydrogen peroxide for instance). Sterilization involves killing all lifeforms in a substrate. Spawn: pre-grown mycelium; any material impregnated with mycelium (often grain or sawdust) which is used to innoculate more substrates. Spore: like the ‘seed’ of fungi… formed on the cap of the mushroom, are ejected when mature and only if they land in a suitable place will they ‘germinate’ into a hypha, a single fungal filament which needs to combine with another hypha to grow and flourish. Substrate: any organic material on which mycelium will grow. In cultivation, this is usually straw, sawdust, compost, soil, woodchips, logs, coffee grounds, etc.